The Shard is likely to remain a much argued-upon building for a while, but to set the record straight, one must understand the context of its evolution. 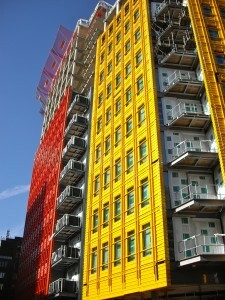 In 2000 the British government issued regulations to encourage high-density development at transit nodes. Given London’s spread footprint, it was a right decision. 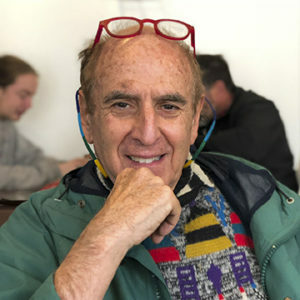 Developer Irving Sellar bought a 24-story building adjacent to the London Bridge, an area where 300,000 people go trough daily using public transportation, and decided to tear it down and build in its place a 1,300-foot high building. He called Piano for the job. Piano was at first reluctant to accept the commission, but he knew that if he didn’t someone else would and he accepted the challenge. The building includes 27 floors for offices, three for restaurants, 19 for a Shangri-La hotel, 13 for apartments and 5 for indoors and outdoors observation galleries. The creation of multiple spaces on floors 31-33, in-between the top of the offices and the bottom of the hotel, is a clever idea although not new. Le Corbusier’s put a two-story shopping area half height at the Unité d’habitation in Marseilles in 1952; Foster’s Hong Kong and & Shanghai Bank tower, completed in 1986, has several double-height reception areas that break down the scale of the building both visually and socially. The pointed pyramid’s four sides are split into eight tilted and oblique planes that surround the core. Seen from the Thames, with Foster’s City Hall in the foreground, the Shard looks pretty natural; however, when seen from the Borough of Southwark, where most of its masonry buildings are low-rise, it looks out of place. Have it been placed in Dubai, Hong Kong or Shanghai, the building would not raise eyebrows. 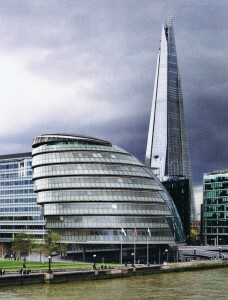 But in 2012 London, it becomes a reminder that a new order is likely to shape the city tomorrow. Taller buildings will follow. 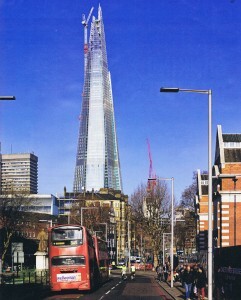 Central Saint Giles Court, co-designed by Renzo Piano and Fletcher Priest Architects, is in full contrast with the Shard. It is a mixed-use, adaptive reuse development of a former dim government building that nobody noticed. Good design transformed it into a colorful commercial development of offices, apartments, restaurants and cafes on the edge of Covent Garden and of Theatreland, with the British Museum and Oxford Street nearby. 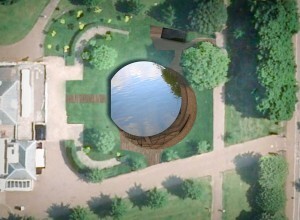 Piano said that he wanted to create a “joyful heart” for the area, crossed by routes between the nearby famous places. Winter gardens were put on the office floors, which were broken up with recesses and projections. Roof terraces were created. Yet the complex the most striking components are the facades, covered by glazed tiles in vivid shades of green, orange, lime and yellow. Notwithstanding the qualities of the Shard, St. Giles maybe more meaningful, because it is a good example of the kind of urban renewal that so many cities are in desperate need for. Higher density and multi-use does not necessarily imply high-rise. Manhattan and Paris have about the same density, 55,000 and 63,000 thousand people per square mile respectively. London has about half of Paris’: 34,000 per square mile. Yet the message with farther meaning for the future of the world’s large and congested cities may not come from buildings, but from a reinvented use of a known technology: the cable car. 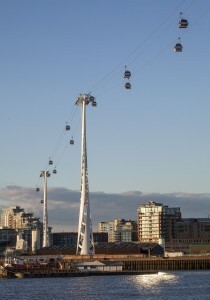 Londoners and visitors are now able to experience a direct and quick way of crossing the river enjoying the fantastic views from suspended cabins. The Emirates Air Line, 1.1km crossing from Greenwich Peninsula to the Royal Docks, can carry up to 2,500 people an hour each way at heights of up to 90 meters over the river below. The ride takes five minutes and costs about £3.20/$5. Wilkinson Eyre was commissioned, with Expedition Engineering, as architects. The team had to fit the crossing into a corridor with numerous constraints that included a minimum 54-metre clearance for tall ships, multiple landholdings and existing infrastructure. The sculptural form of the Emirates Air Line’s towers makes an exciting addition to the London skyline. Their open, spiraling structure merges engineering and aesthetics to provide a visually light construction that minimizes perceived mass. I can begin to imagine the effect of these technologies in cities with high populations and heavy traffic like New York, Chicago, Paris, Shanghai, Tokyo and…Los Angeles. 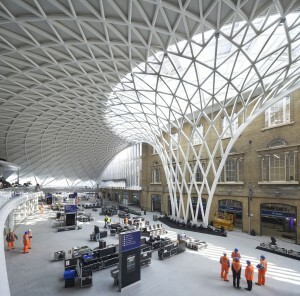 In dealing with infrastructure renewal, the most impressive development is the expanded King’s Cross terminal, the gateway to Northern England and Scotland. Designed by John McAslan and Arup, the project includes re-use, restoration and new build. The train shed and range buildings have been adapted and re-used, the station’s façade has been restored and a new highly expressive Western Concourse has been designed as a centerpiece. This project is just one portion of new privately developed public realm which includes 20 new streets and 10 new public spaces. 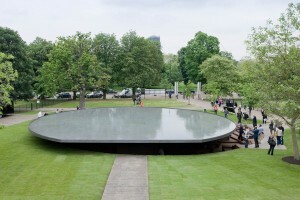 Since 2000, the Serpentine Gallery in London’s Kensington Gardens has called on some of the world’s top architects to design summer pavilions – temporary structures that are erected next to the Gallery itself for a three-month period. Herzog & de Meuron and Ai Weiwei, who previously collaborated in the conceptual development of Beijing’s Bird Nest stadium, joined forces once again. 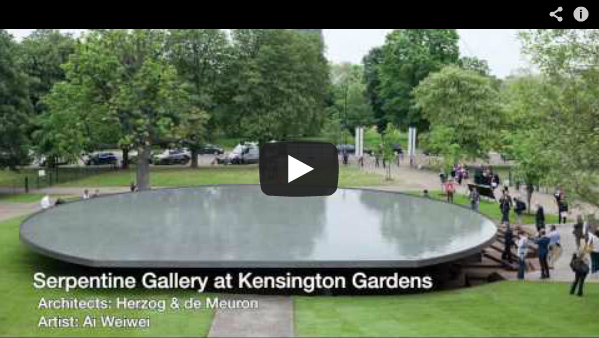 The new pavilion consist of a floating platform roof 1.4 meters above ground which collects water and becomes a mirror, reflecting the changes in the London sky. The Pavilion’s interior is cladded in cork, a sustainable building material chosen for its unique qualities. It reminds some of Carlo Scarpa’s approach to design. The Olympic effect is much greater than a 17-day sports event.